Introduction. The right to health care occupies a special place in the system of fundamental social rights. Health is one of the highest values of human life. The right to health care includes right to organ transplantation and, respectively, right to organ donation. In some cases only through transplantation it is possible to save lives and to restore the basic functions of a human body. The need for human organs and tissues is characteristic to contemporary societies and a gateway to interventions of incalculable beneﬁt to mankind, either as forms of treatment or as precursors to the development of preventive, therapeutic and diagnostic strategies [1, c.1]. Organ donation and transplantation have been studied, of course, within medicine and biology but they also have important social dimension, especially in regard to health care systems and individuals’ need for organ transplants and possible legislative regulations both, in Ukraine and abroad. In the process of organ or tissue transplantation people enter relationships, which require detailed regulation. These relationships can be built and constructed on different principles in different systems. They can acquire the character of the contract or religious welfare effect. These relations can also be based on principles of equality, humanism and combined personal and social needs, but they are still strictly controlled by the state and regulated by law. General background. Organ transplantation is a last resort treatment options in a number of diseases. In addition to being a treatment option, organ transplantation currently scientific testing in areas that can be exposed to the medical experiment from a legal point of view (such as research methods of conservation, impact of new methods of using immunosuppressive drugs on persons, who suffer from complications caused by a transplant, etc.). Despite the fact that organ transplantation sometimes is the only means of saving a person’s life, the operation in itself includes many risks. However, in many countries the man problem is the shortage of donor organs. For instance, in Ukraine annually some two thousand people are in need of a heart transplant, but not a single person gets it. A kidney transplant is needed by four thousand people per year. In reality, it is only received by 80, maximum of 100 people. Approximately 2 - 2.5 thousand persons per year need a new liver but only some 30 to 40 people get it . In comparison to other post-Soviet countries, Belarus is leading when it comes to performing organ transplantation – during January-November 2012, 251 organ transplantations were performed, including 50 liver, 182 kidney and 19 heart transplantations. In Belarus there are on average 25,5 organ transplants per 1 million persons. In contrast, in the Russian Federation this figure reaches 9.5 transplants per million, and in Ukraine only 2.2 . Analyzing the statistics data in the European Union over 63,800 patients were placed on organs' waiting lists on 31 December 2012 (up from 61,500 in the EU on 31 December 2011). The number of patients who died while placed on waiting lists in the course of 2012 was estimated to be 3,780 for the European Union in 2011 (down from 5,500 in 2011) . Taking into account the importance and necessity of precise legal regulation of organ transplantation, the main research question of the present article can be defined as to how the current legislation in Ukraine (particularly ‘presumption of dissent’) contributes to its low rate of organ transplants. The current regulation of organ transplants in Ukraine. Ukrainian healthcare legislation regulates a wide spectrum of relations and consists our of a large number of legal acts that are in conjunction with other legal spheres of life. The Constitution of Ukraine is at the center of legislation that regulates social relations in health care and medical care. Article 49 of the Constitution of Ukraine is especially dedicated to healthcare and medical assistance, and enshrines the right of everyone to health protection, medical care and medical insurance. On the 19th November 1992, the Verkhovna Rada of Ukraine (The Parliament) adopted the national Act on Basic Principles of Legislation of Ukraine on Healthcare in which the following principles of legal regulation of organ transplants and other anatomical human materials were established: 1) the application of the method of transplantation from a donor to recipient organs and other anatomical materials is specified in the law in the existence of their consent or the consent of their legal representatives. Transplantation should be provided if the tools and techniques for sustaining life, restoring or improving the health did not give the desired results; and caused harm to the donor is less than that threatens the recipient; 2) the donor of organs and other anatomical materials must be a capable adult individual . The 1992 Act did not include provisions on organ transplants from corpses. However, this shortcoming was remedied with the passing of the 1999 Act on the Transplantation of Organs and other anatomic materials (hereinafter – Act on Transplantation). This law applies to activities related to the capture, storage and transportation of organs and other anatomical materials and their further transplantation to recipient and manufacturing of bioimplants . - Donation of blood and (or) its components and activities associated with their use. This is due to the fact that there already is a law that regulates this area – the national law “On the donation of blood and blood components”, adopted on 23 of June 1995. - Taking the anatomic materials for diagnostic studies and researches . In addition to developing its own national law, Ukraine is a party to international conventions related to organ transplantation. In 2002, it signed the Convention for the Protection of Human Rights and Dignity of the Human Being with regard to the Application of Biology and Medicine: Convention on Human Rights and Biomedicine, and in 2006 - two additional protocols to the Convention on human Rights and Biomedicine, namely the Additional Protocol concerning transplantation of organs and tissues of human origin (CETS №186) and the Additional Protocol concerning Biomedical Research (CETS №195). According to the information of the Ministry of Justice of Ukraine the mentioned documents have been ratified by Ukraine . The existing legal framework of organ transplantation, an ongoing shortage of donor organs and the fact that 90% of the organ transplantations performed use post - mortem transplants, makes it important that health professionals and lawyers are clear on the legal foundations for the removal of organs and tissues from the body of a deceased person . During the time of the Soviet Union, there were three ways of obtaining organs: a) routine sampling; b) organs donated on the basis of the presumption of consent (presumed consent); c) donation based on the mechanisms of informed consent (informed consent). The peculiarity of routine sampling is that authorities had discretion to dispose the body of a deceased person. In particular, healthcare authorities were entitled to conduct an autopsy, for the purposes of taking organs and tissue for transplantation, scientific and other purposes. The body of the person would in this case be treated as public property that physicians may use in the public interest. This method raises a number of legal and moral issues. Primarily the violation of the human right to own and dispose of the body. Furthermore it potentially violates the moral beliefs of the family of a deceased person. This method was very popular in the Soviet Union, but today its application is not supported neither by legislators, nor by doctors. Thus Ukrainian medical practice after becoming independent went the other way [9, c. 305]. The second method - the presumption of consent - differs from routine sampling on the following point: expressed consent to receive organs after the death of a person has not been given; however this consent is anticipated (absence of such consent leads to the rejection of such manipulation). Finally, the third method to obtain organs for transplantation is “presumption of dissent”. The legal basis for this was developed in the Act on Transplantation of organs and other anatomic materials [9, c.306]. We will further examine the third approach due to the fact that the current model of "presumption of dissent" and a very negative attitude of the citizens of Ukraine to organ donation have created a high shortage of organs and virtually brought the possibility to transplant organs in Ukraine to a standstill. The negative attitude of citizens is caused by the few reasons: periodically appearing in mass media reports about illegal transplantations; distrust to modern medicine in general and to the doctors particularly; lack of funding of health care from the state and local budgets; ambiguous attitude of the religion and the church for question of donation and transplantation and low public awareness in this sphere. Presumption of dissent implies an agreement of the deceased person to remove her/his organs after death ("expressed consent of the person") or obtain such consent from the next-of-kin ("requested consent from legal representatives"). Capable adult person may give a written agreement or disagreement to donate anatomical material in the occasion of his death. In the absence of such a statement anatomical material of the dead adult capable person can be taken with the consent of the spouses or relatives who lived with him/her. Anatomical materials of minors or disabled persons can be taken with the consent of their legal representatives . It can therefore be concluded, that the existence of a document that recorded the will of the deceased or the consent of a relative or legal representative is essential in such an approach. Fundamentally, this consent may be contained either in the will of a donor, or in a separate document certified by a notary or other persons having the right to do notarial acts. In addition, a person who has agreed to donate after death has the right to refuse such consent. The Ukrainian law does not define when such a refusal may be performed nor the relevant procedure for such a refusal. 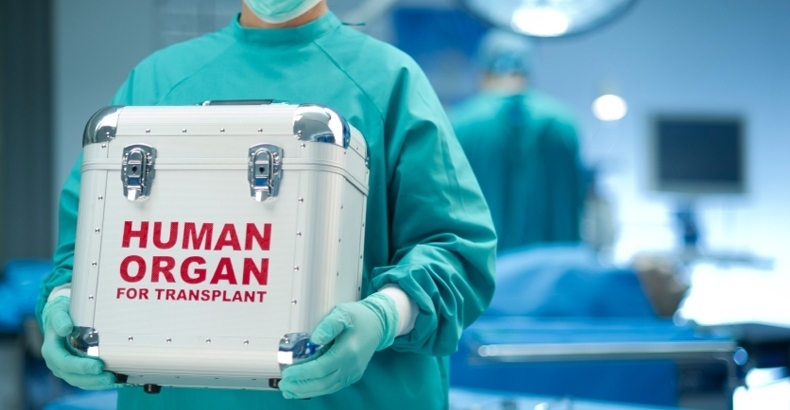 Another negative aspect of the existing model for receiving organs is included in the Act on Transplantation which provides an unspecified number of relatives who must provide the consent before is allowed to use the organs of the deceased. These can be the spouse, the children of the deceased or his parents. Since it is possible that in a case multiple people have the right to consent this could lead to a conflict of consents. That is a situation where one of the eligible persons expresses their consent to donate organs and other anatomical material, while others did not give such consent. This problem around consenting in Ukraine has not been solved. Another disadvantage of the model based on the principle of "presumption of dissent" is the fact that relatives are required to answer the delicate question of giving consent or withholding it, in which they experience excessive stress due to the sudden death of a loved one. This does not give them the opportunity to fully and clearly think this over. It would be logical therefore to offer the following solution, which is also called the "model of reconsideration period ". According to it, relatives do not immediately make a decision that permits the removal of organs. After informing them about the possibility of donating the organs, they will have a certain amount of time to express their agreement. Thus, in conversation with relatives it will be emphasized that if disagreement is not expressed by the deadline, the transplantation will be performed [10, c.5]. Returning to the statistics that were indicated in the introductory part, Ukraine currently conducts only 2.2 transplants per 1 million of population. The situation in Belarus was similar to that of present day Ukraine until it introduced the "presumption of consent". Current regulations do not meet the potential needs of physicians and patients. Improving the legislation around transplantation is an urgent issue for Ukraine, because of the long legislative procedures and that while that is happening there are still many patients in need of donor organs. As we can conclude the approach of “presumption of dissent” complicates the process of expressing a desire to donate an organ. Another point that has negative impact on the Ukrainian system of health care in general and on the sphere of organ transplantation in particular is that the development of transplantation in Ukraine is hampered by the lack of a unified state mechanism to coordinate the work of health care institutions. Nowadays in Ukraine the level of state funding for health care and public research institutions that are eligible to be active in the field of transplantation of donor organs reaches only 5-10 percent of the needed funding. The next negative point is about the level of GDP or health care funding over the last few years (especially in 2014-2015 when Ukraine ended up in an economic crisis in general). There is the acute need to reform the Ukrainian transplantation system, improve training of physicians, increase the amount of operations and strengthen the public confidence in transplantation as a method of returning life. Another equally important problem is the lack regulation that would oblige hospitals to inform transplantation centers of the presence of potential donors. In the article we tried to examine the advantages and disadvantages of different methods for procuring organs for transplantation. The reasons for the differences in the amount of donated organs can be found not because of special programs or funding of such kind of operations, but in the choice how to regulate the removal of organs. In introduction was mentioned, that Belarus already seethe positive effects from changing its national legislation in the sphere of procuring organs. Ukraine, as one of the Post-Soviet countries, with common history and legislation can take Belarus as an. The first steps for improving national legislation in the sphere of organ transplantation were made in 2013, when a special Committee of the Parliament developed a new draft law #2184a amending the Ukrainian Act on Transplantation. The circumstances that led up to this bill are the following: poor state regulation of state and municipal institutions and agencies associated with the transplantation of organs; low public confidence in the order of taking and use of organs and tissues from deceased donors; imperfection of the Unified Information System in the field of transplantation . Therefore, the main innovation of the introduced draft law is "presumption of consent" or “presumed consent”, which is completely opposite to existing dissent presumption. If the law gets implemented then the "presumption of consent" will allow for cells organs and tissues of the deceased person to be used for donor purposes without the consent of relatives. However, the process of drafting regulations does not always meet international standards. The abovementioned bill №2184a includes rules to make anyone who, during his life does not issue a statement of disagreement automatically become a donor of organs. However, the Ukrainian bill, contrary to Article 4 of Directive №2010 / 45 / EC on standards of quality and safety of human organs intended for transplantation, does not provide detailed audit testing of the consent of the donor or his family, proving of consent or objections the removal of the body that creates a risk of abuse in determining whether the removal of organs and tissues in humans and can cause serious social conflicts (for example, when the family receives a “disemboweled” dead body for a funeral). In addition to the presumption of consent the new bill proposes to introduce a completely new concept of "emotional donation", which means that consent for the donation of organ is received from a person who has an emotional connection with person, who needs organ for transplantation. Of course, will the expansion of the number of consent givers to close friends and acquaintances have a positive aspect on the total number of available organs, but because of imperfections in the formulation and uncertainty criteria such donation may have space for speculations. It should be stressed that the Ukrainian parliament did not approve the Draft Law in first reading, At the moment the Ukrainian legislation still refers to the “presumption of dissent” and it is unknown if the government will make a new draft law to change this by taking European legislation as an example. Conclusions. The main task of the article was to find out how the current legislation in Ukraine and especially the implemented ‘presumption of dissent’ contributes to the low rate of organ transplants. As was found in the article the principle of "presumption of dissent" in Ukrainian legislation; reports in mass media about illegal transplantations; distrust to modern medicine and to the doctors; lack of funding of health care from the state and local budgets; ambiguous attitude of the religion and the church for question of donation and transplantation and low public awareness in this sphere cause situation of acute shortage of organs for transplantation. 1) Analysis of legal acts regulating organ transplantation in Ukraine suggests that in general legislation on transplants is established, but the development of the concept of transplantation should be detailed in a number of subordinate legislation or so called by-laws due to the peculiarities of the legal system of Ukraine (because the work of the Ministry of Health Care and its central bodies is governed by the adoption of regulations and subordinate legislation that should provide a mechanism for implementation of the Act On Transplantation. The need for reform of the regulatory provisions is due to the lack of developed criteria for accreditation and certification of institutions that are eligible to carry out activities related to the transplantation, transplant standards for providing assistance and determining nosology in which it is applied, unified mechanism for typing of donors and recipients. Issues related to the donation of organs and tissues that can be used as medical activities should not just be explicit in the legislation, but also consistent with the medical and pharmaceutical workers, psychologists, and even members of the clergy. 2) From the analysis of the existing legal framework governing the donation and transplantation of organs and tissues, it follows that transplants increased interest in the community. Nevertheless, analysis of the sources of legal regulation of these relations shows that there are significant gaps in the regulation of matters relating to the procedure of receiving of organs, obtaining consent from the donor and / or his close relatives, moral and ethical issues of taking organs from a deceased person. 1. Price David “Human Tissue in Transplantation and Research: A Model Legal and Ethical Donation Framework”/ D.Price. - Cambridge University Press. The Edinburgh Building, Cambridge CB2 8RU, UK. – 2009.- рр. 1. 2. Sandul I. “Organ transplantation in Ukraine - dead deadlock” / I.Sandul. - 05th of April 2011. Електронний ресурс. – [Режим доступу]: http://transplant.zp.ua/content/%D0%BF%D0%B5%D1%80%D0%B5%D1%81%D0%B0%D0%B4%D0%BA%D0%B0-%D0%BE%D1%80%D0%B3%D0%B0%D0%BD%D0%BE%D0%B2-%D0%B2-%D1%83%D0%BA%D1%80%D0%B0%D0%B8%D0%BD%D0%B5-%E2%80%94-%D0%BC%D0%B5%D1%80%D1%82%D0%B2%D1%8B%D0%B9-%D1%82%D1%83%D0%BF%D0%B8%D0%BA. 4. 4th Journalist Workshop on Organ Donation and Transplantation. 7 October 2013. Recent Facts and Figures. Електронний ресурс. – [Режим доступу]: http://ec.europa.eu/health/blood_tissues_organs/docs/ev_20131007_rd3_en.pdf . 5. Act of Ukraine “Basic Principles of Legislation of Ukraine on Healthcare”, adopted by Verchovna Rada of Ukraine on 19.11.1992. Електронний ресурс. – [Режим доступу]: http://zakon4.rada.gov.ua/laws/show/2801-12. 8. Pishchita A.N. “Consent to medical intervention: Medico-legal analysis. Legal Standards. The practice sales” // A. Pishchita. - Russian Medical Academy of Postgraduate Education. – Moscow: Central Clinical Hospital, Russian Academy of Sciences. - 2006. - 210 p.
10. Sayenko V.F. “Organ transplantation: problems and prospects”. // V. Sayenko. – K.: Transplantation. – 2004. - Vol 1. - p. 4-7.